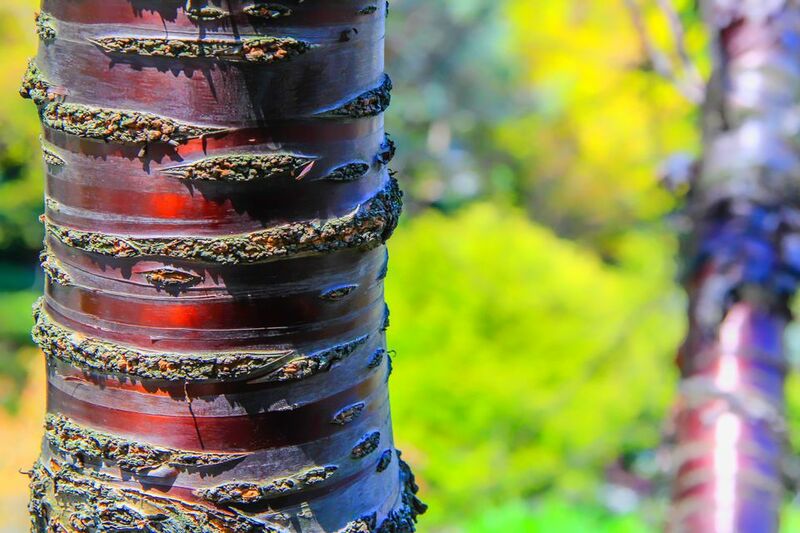 Paperbark cherry is best known for its stunning bark―the dark coppery peeling bark is actually a plastic film, and it works quite well for winter interest. Unfortunately, it isn't planted that often because it is highly susceptible to borers and diseases, making it a short-lived tree. Still, if you have room in your yard for this showy little beauty, think about giving it a chance. The scientific name assigned to this species is Prunus serrula. It is included with the other Prunus trees and shrubs in the Rosaceae family. Names that you may see associated with this tree are paperbark cherry, Tibetan cherry or birch bark cherry. Paperbark cherry grows best in zones 5-8. It is native to China, Japan, and Korea. This tree grows 20-30' tall and wide and has a round shape. Plant the paperbark cherry in full sun for best results. The leaves are 2-4" long with serrated edges. They are dark green, turning yellow in the fall before they fall off. In late spring, the tree is filled with clusters of tiny (.75") 5-petaled white flowers. The fruit is a small (.5") inedible red drupe. Excellent for winter interest as the shiny bark will definitely stand out. Plan on this tree being short-lived, as it usually falls prey to insects and diseases readily. This can be used as a rootstock for other cherry trees. One combination that is especially lovely is a weeping cherry grafted on top of the paperbark cherry. Plant in a location with fertile soil that is moist, but has good drainage to avoid problems like root rots. Propagation is through seeds, cuttings, and budding. This tree does not usually require much pruning besides removal of problem branches (i.e. any that are dead, diseased or damaged). Since they bloom in the spring, it is best to wait until just after blooming has finished. You want to catch them before they start forming the buds for the next year so that they are not accidentally removed with your cuts and the floral display for the following year is impacted. Paperbark cherry is highly susceptible to damage from borers and beetles (such as Japanese beetle), which can severely weaken the tree. Aphids, scale, spider mites, tent caterpillars, and leafhoppers can also be a problem. As with all cherries, this species is also prone to several diseases. Leaf curl, fire blight, dieback, leaf spot, cankers, powdery mildew, and root rot are all diseases that may show up in the paperbark cherry. What Are Some Beginner Tips When Growing an Austrian Pine?